Pro bloggers are known for delivering great blog posts that consistently give their audiences exactly what they need. In addition, these posts are perfectly optimized for specific keyword phrases. This allows each post to move up to the first page of Google and drive loads of organic traffic for years to come. If you want your blog posts to have a similar kind of impact with your audience and Google, then you need to incorporate these five incredible tactics. Number One: Browse through past emails that individual members of your audience have sent you. Most bloggers get emails from their audience asking questions or seeking advice in a particular area. You can go back through several years of your reader emails and find tons of great ideas for new blog posts. Number Two: Create a new blog post to answer a reader email instead of replying with a long email. There are some questions that I get that can be answered with two sentences, but there are others that need a deeper detailed response. In these cases, an email will not do. By creating a customized post for your reader, you will add a great piece of content to your blog, and you will turn the person that sent you the question into a raving fan. Another benefit to writing blog posts to reader questions, is that you will be able to save time by not having to answer the same question over and over again. Most of your email questions will be asked again by different readers. By addressing questions with links to your blog posts, you will save time and deliver a detailed answer to your audience. Number Three: Ask an open ended question to your email list about what they want you to write about. Many bloggers will make the mistake of surveying their email list with a multiple choice answer to find out what they want. While this may answer a question, it will not give you new ideas for blog posts. You should send them an informal email that is text based only. Here is an example of a good open ended question email that will generate a nice response from your list. I would like to know if there are any topics that you would like me to write a blog post on. Is there anything that you want to know more about or that you are struggling with right now? I want to make sure that I am writing blog posts on the topics that will benefit you the most. Thank you very much for taking the time to answer this question. A simple email like this can flood your inbox with blog post ideas that your audience wants and needs. This is the area where surveys should be used. Social Media Examiner started as a small blog, which few people noticed before they started surveying their audience at the beginning of each year. Their audience was made up of marketers that were using social media marketing. One year they sent out a survey with questions that addressed upcoming yearly budgets, time spent on each social channel, the social channels that generated the most customers, and many other questions like this. They took all of the answers and turned it into the Social Media Marketing Industry Report. The report was filled with charts, graphs, and insights about the answers. Over the years, this report has generated over 500,000 email subscribers for Social Media Examiner. If you are not ready to create an industry report, then start by coming up with a few survey questions that can be turned into charts and infographics. For every chart and infographic you make, write a blog post explaining what the statistics infer. After you publish the post, promote each chart and infographic on Facebook, Pinterest, and Twitter. You can take your post to another level by creating an embed code that allows anyone to embed your visual into their own blog post. The easiest way to generate embed codes is via embed.ly. Whenever you are faced with an obstacle, being big or small, share it through a blog post. Your audience is made up of real people, who are facing their own challenges. With every personal story you share, you are going to build loyalty and trust with your audience. I have struggled to overcome health obstacles for the last 15 years. I share these experiences with my audience because I know many of them have experienced their own health struggles. I went from a successful business owner to being disabled and unemployable. When I was finally healthy enough to do something, my personal debt was close to a half of a million dollars. I was also facing a lifetime of taking a multitude of medications along with a sleep schedule that kept me in bed for 12 hours a day. With my sleep schedule alone, I could not get a job even if I wanted to. My only choice was to start my own business, which eventually led me to the world of blogging. Make a list of all the struggles you have faced in your life. Then turn each of these struggles into a blog post, which shares what you learned from the experience. This is a public relations tactic that is referred to as newsjacking. David Meerman Scott is known as the founder of the newsjacking movement. Newjacking is essentially the art and science of injecting your ideas into a breaking news story so that you and your ideas will get noticed. 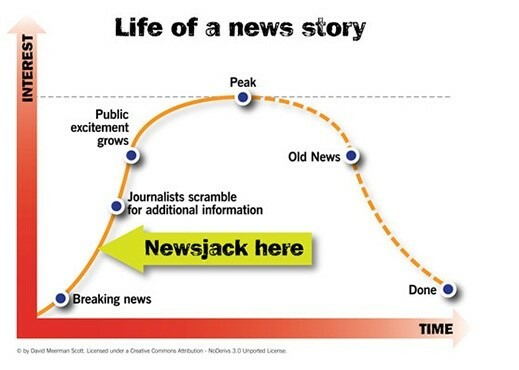 To better understand this, let me walk you through the life of a news story. You will newsjack with your blog post right after the breaking news happens. This is when the journalists begin to scramble to find more information on the breaking news. Since there is not much out there after a breaking story, your post is going to get read by plenty of journalists. If they like what they read, then you are going to a high authority link along with plenty of referral traffic. Although there are many types of newsjacking article formats, the easiest type to execute is the recap with takeaways post. The first part of your post will be a recap of breaking news story. It will include a recap of the five Ws. After your recap, you will offer your perspective on the news. This will include unique takeaways for your readers. This can be done with national or industry news. I personally like to focus on industry news. This allows me to get targeted referral traffic, that turns into subscribers and clients. Here is an example of a breaking industry news story that I newsjacked. My post covered the key takeaways from the breaking news, three examples of Google interstitial violations, and how to keep your site from getting penalized by Google. I was able to successfully newsjack the story, which led to a bunch of shares and inbound links. Anyone that has a marketing blog can use this exact example over and over again with every Google and Facebook algorithm update. This is how the majority of pro bloggers generate 80% of their blog post ideas, and they prefer to use SEMRush as their keyword research tool. It verifies that there is a significant demand for a particular topic. The last thing you want to do is to write post after post on topics that no one wants to read about. SEMRush shows you the number of monthly Google searches that take place for every keyword phrase. This enables them to write posts on the topics that people are actively searching for on Google. When you become an expert at keyword research, you will be able to build a mountain of organic Google traffic. Most pro bloggers have a secret keyword research system in place. These systems allow them to identify the keywords that have a nice monthly search volume and also have little competition in Google. This allows them to focus in on the topics that have a small supply of blog posts with a large demand of search volume. It allows you to expand on topics that your blog is already ranking for and your audience loves. I grew my blog traffic from 50,000 to 500,000 monthly visitors using my own keyword research expansion formula. Keyword research is one area that bloggers continue to ignore. They either do not apply it, or they take the frequent shortcut of just using the free Adwords keyword research tool. If you just spent one full day studying a successful pro blogger’s keyword research system, then you would be able to tap into an endless supply of organic Google traffic. I have spent five years continually perfecting my own keyword research system. This system is responsible for generating hundreds of millions of organic Google visitors for my blogs. I break down this entire system in the fourth video module of my online course.